Excessive consumption can cause laxative effects. Store in a cool dry place out of direct sunlight. Store out of the reach of young children. Do not exceed the recommended daily dose. It's arrived the ultimate protein experience! Tantilise your taste buds, melt in the moment and chow down on our high protein, chunky caramel crisp bar. Take a bite into our all new indulgent caramel crisp protein bar! Formulated to curb cravings we've nailed the protein ratio with triple layered chocolate, soft fluffy nougat, cream caramel, milk chocolate and soy crispies. Each PRO 2GO CARAMEL CRISP bar contains 21 grams of milk protein which provides a natural blend of whey and casein for a fast and sustained supply of amino acids to muscles. The crisps also contain soy protein which is high in arginine and glutamine. New from SCI-MX Nutrition, PRO 2GO CARAMEL CRISP is a breakthrough bar that will dominate convenience snacking – it rivals the taste of standard confectionery bars, but contains high levels of protein and the right macronutrients to support muscle development1. This indulgent bar has been formulated in response to a need for a great tasting protein bar - which is exactly what we’ve done! So take a bite into this insanely good triple-decker protein bar, and still hit your macros! 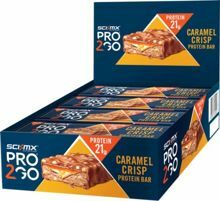 PRO 2GO CARAMEL CRISP features a deluxe triple-decker experience that gives your standard chocolate bars a run for their money – It contains a light and fluffy nougat base, covered by a layer of soft creamy caramel, topped with soy crispies and coated in milk chocolate. We’ve used natural xylitol to add sweetness without excess calories, so it’s a guilt-free treat for the smarter snacker. 1Protein contributes to the growth and maintenance of muscle mass.